I’ve been preparing a packing list today and looking around for items on that list to include in my bags for the upcoming vacation I mentioned in the previous post. While doing this, I’ve been listening to free internet radio site Live365, where you can find all kinds of music. I’ve had the Dominicana Digital station from the Dominican Republic grooving me all afternoon with merengue, salsa, bachata, reggaethon and other hot Latin music. With the cold, blustery weather in Yeosu right now, I sure have a yearning to be sitting in my former Weekend Office, but, alas, it’s too far away and too expensive to get there. No, unfortunately, that’s not where I’m going on winter vacation. Here’s a shot looking toward the Boca Chica lagoon from my old Weekend Office. And, looking further down the beach . . . 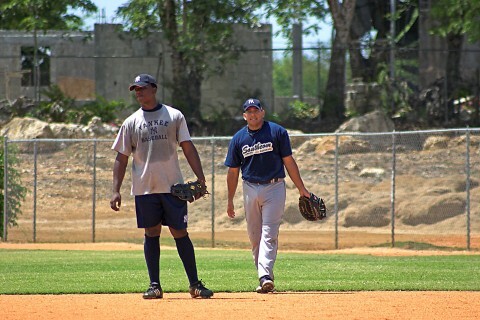 Someday I hope to return for a visit to the Dominican Republic and Boca Chica, but it’ll be in the summer, when the Yankee baseball camp is in full swing. Until then, I’ll have to settle for the warmer climes of . . . Laos and Thailand, next weekend. I won’t be going to any Thai beach areas, but at least it’ll be nice and warm there and in Vientiane. Can’t wait. More later. It’s a bit tough (tongue firmly in cheek) sitting on the beach in Boca Chica under this unwanted cloud cover when you’ve got ants in your pants to go somewhere else. Being not that far from the airport, you can see all the larger international jets soaring into the sky, leaving for South America, Mexico, Europe, and other destinations. You wish you were on one of them and going to somewhere sunny, somewhere like, oh, . . . Thailand, for example. Well, it seems that way; at the least, I’m always a week late in my posts here. Anyway, last Sunday was a great day, as far as sports go, at the Weekend Office. I watched the Yanks score 4 runs in the bottom of the 8th inning to win their 5th straight game, 6-5 over Seattle. Then, I remembered that the Indy 500 was running. I asked one of the waiters to switch the TV and I was lucky enough to catch the last 24 laps of that event, won by Scott Dixon. I think that’s the first Indy I’ve seen live since I left the U.S. back in 2003. The week before, once again, the Canadian National Junior All-Star team visited the camp to play an exhibition game against the Yankee squad, and, once again, like last year, they kicked rear end, beating the Yanks 13-2 or some such ridiculous score. They’re a very good team, obviously. Sporting flags and banners, lots of Canadian embassy people turned out to watch. Here are a few of them making their way onto the field to throw out the ceremonial first pitch. Here’s a shot of the game in progress. 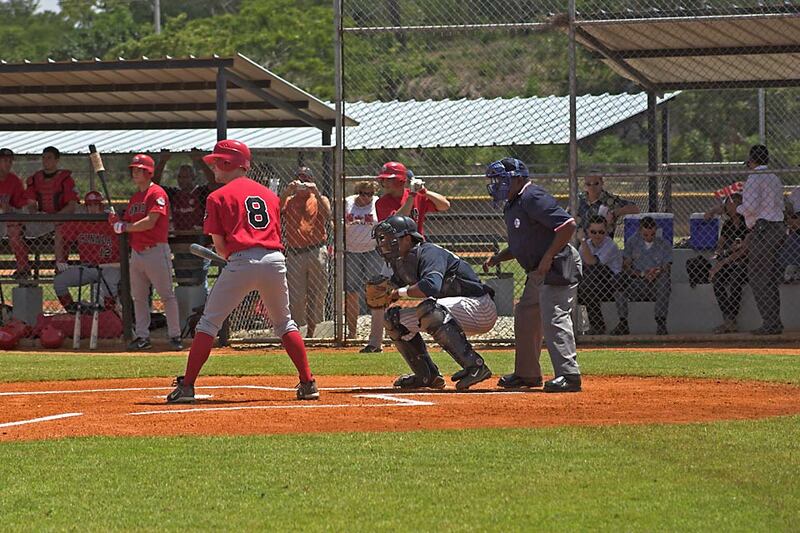 Today is Opening Day of the Dominican Summer League, but both Yankee squads are traveling to other camps to play, so there will be no opening ceremonies here, like there were last year. Perhaps I’ll tag along with one of the teams. More later. Since I’m writing this, I obviously wasn’t injured by celebratory gunfire in the aftermath of last week’s elections. 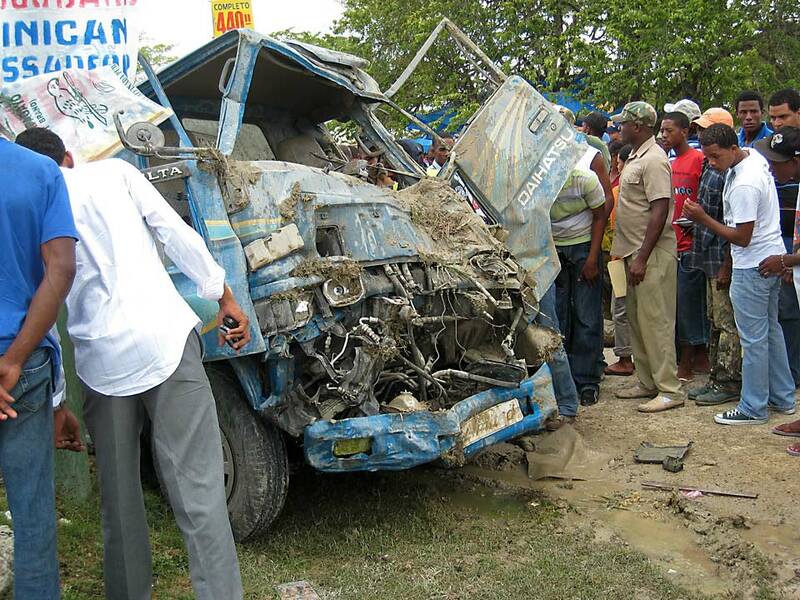 In fact, Boca Chica was fairly normal last Saturday–the taxi driver told me that the BIG and crazy celebrations were going on in Santo Domingo and other large cities. 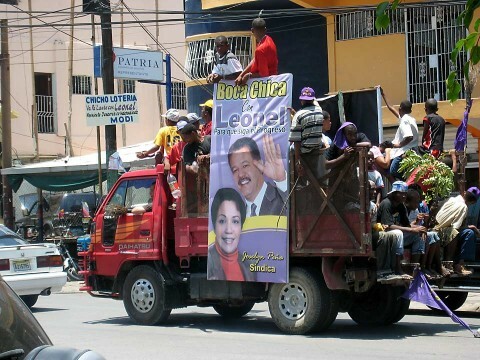 There was, in fact, a fairly long line of cars and pickup trucks loaded with people waving the purple banners of the victorious incumbent, Leonel Fernandez, heading out toward the main highway leading to the capital. 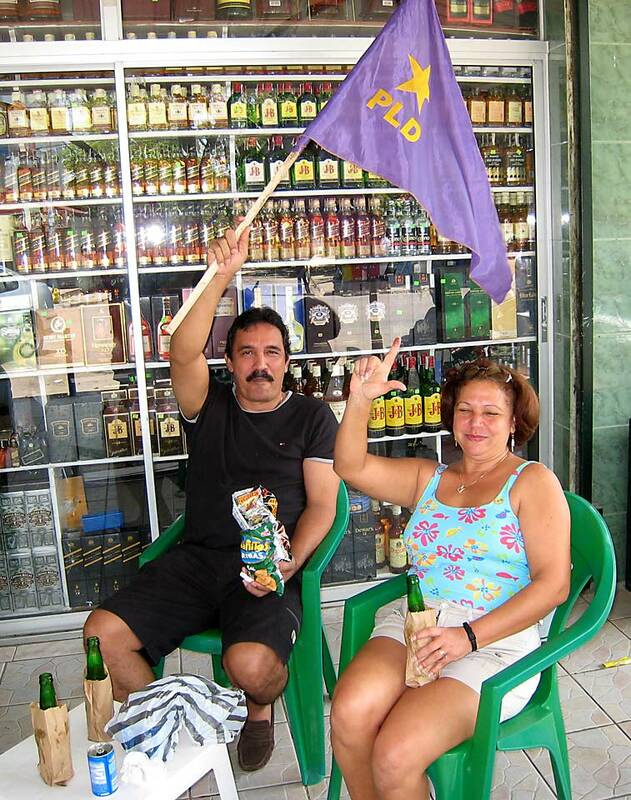 Here are a couple of Leonel supporters having a few cervezas before joining the parade. I FedEx’ed my signed contract and other documents to Korea a few days ago. The process is moving along very nicely, and I hope to receive my visa in a timely manner. I think the documents are all in order, but whenever you’re dealing with a government–well, you just don’t know what other hoops you might have to jump through. There was a LOT of confusion among the players and coaches about when everyone would be allowed to go home to vote. The voting age here is 18, so most of the Dominican players are eligible to participate in the elections, but they have to vote in their home districts. The main scuttlebutt was that they had an intra-squad game today (they did) and would be allowed to leave when that was completed, but they would have to be back for Saturday morning practice. That would have been a completely illogical restriction, but the final word was that they were allowed to go home after the game today, and Saturday practice was called off. Good news for all, except the foreign players, who, of course, can’t participate in the election. But, I called off English classes today, so the Venezuelans and others were happy about that. The weather has certainly changed. Gone are the cool, low-humidity mornings and the moderate afternoons. The sweat that pours out of me on my sunrise jogs has me feeling like I’ve just run through a rain shower. I’ve been wearing long pants to my classes in the afternoon, but I’ll be switching to shorts soon. And my room air-con, which I’ve not had on a whole lot, will now be put to ever more increasing use. This had to have happened not much more than 30 minutes before, since an ambulance arrived as I took the photo. Unbelievably, someone survived the single-vehicle wreck. I glimpsed a guy laid out on the ground, bloody arm and hand outstretched, propped on his elbow. I wasn’t about to get closer to take a photo–very inappropriate, and he was surrounded by a few dozen people as he was loaded into the ambulance. Not a pretty scene. 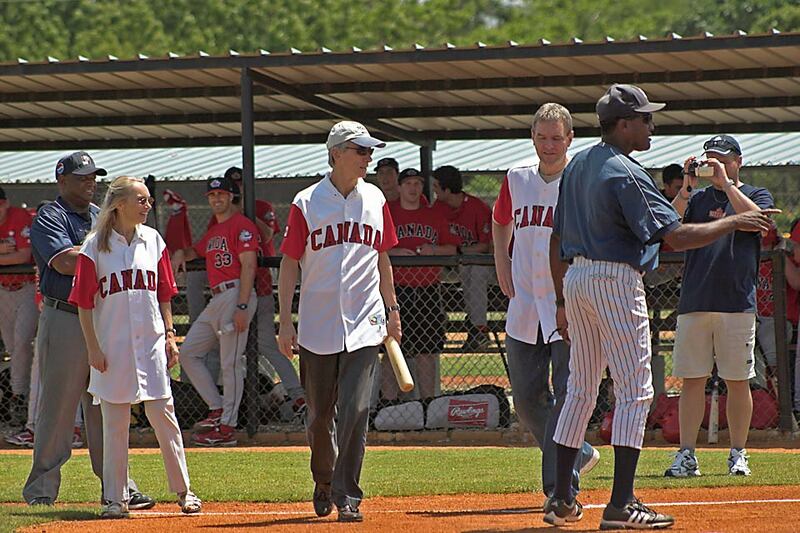 As promised, here are some photos of the April 24th visit to the camp by the U.S. Military baseball team. I thought it was the Army team, but the guys represent all branches of the military. 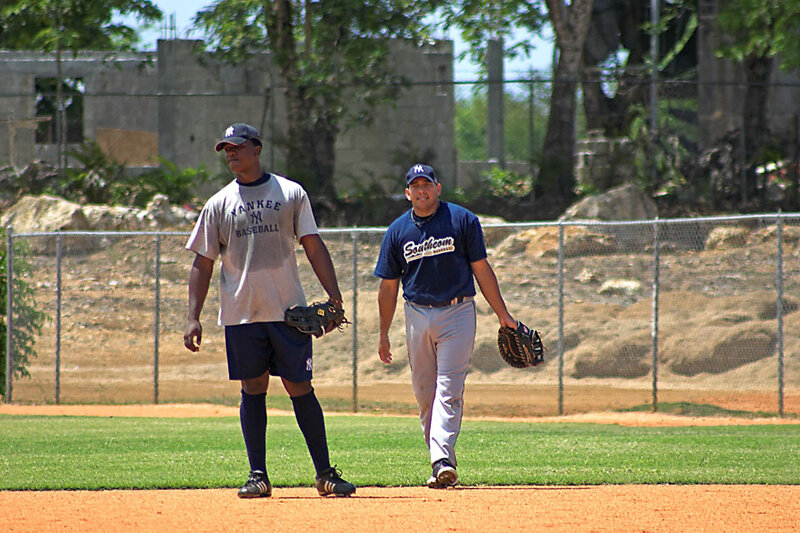 They practiced with the Yankee players about 4 hours, then returned with some of the Yankee coaches to Santo Domingo, where they gave a baseball clinic to some youngsters. It was an interesting visit, something to break up the daily routine. 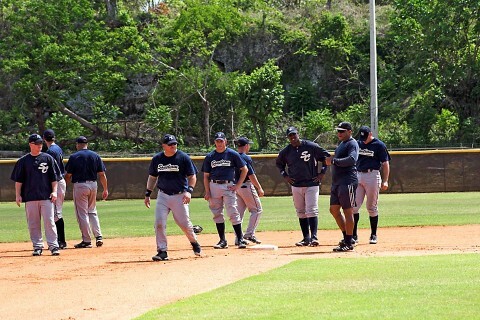 Infield practice at first base. 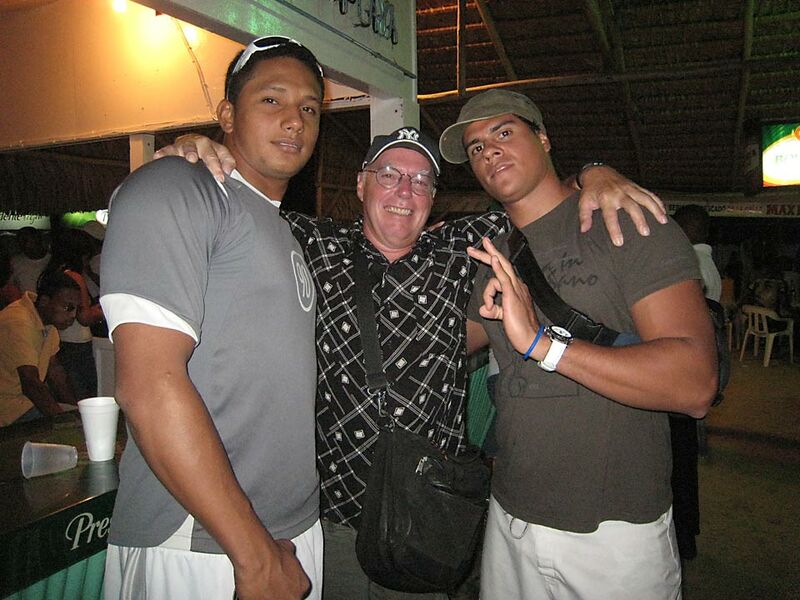 The Yankee kid on the left is Reymond Nunez, from the D.R. He’s a top prospect who can crush the ball a mile. He’s got a great attitude and he’s an all-round good guy. Let’s hope he can hit a curve. If so, he could be a big star at the major league level. I wrote about him in an earlier post. Here, Coach Mota (in the shorts) gives baserunning instructions. Mota, coincidentally, coached with the Missoula minor league team for a few years in the early ’90s. I kid him that the cops are still looking for him. Military team members get ready for practice. Stretching before the practice session. If you can’t figure it out, that’s me in the middle. 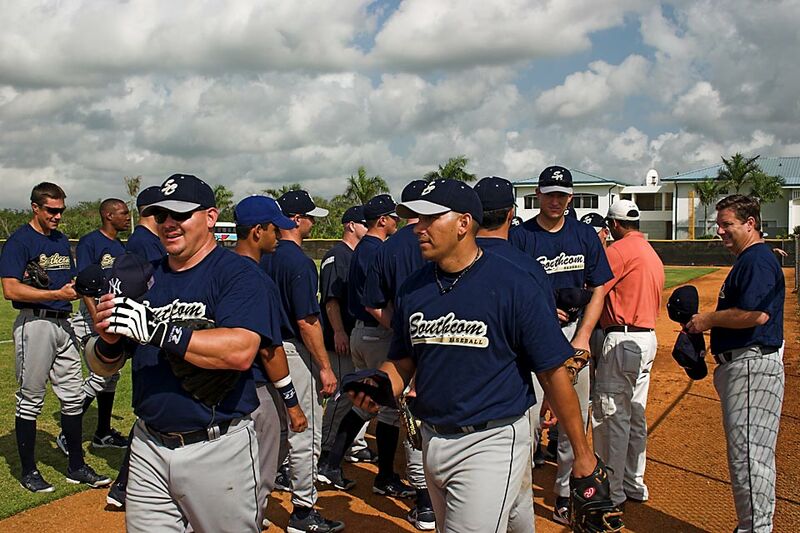 To the left is Luis Guillen, a pitcher, and the other fellow is Manual, the new strength coach. Both are from Venezuela. More later. April 2, 2008 / montanaron / Comments Off on Tropical Storm? No, not really, but we’ve had some very heavy downpours the last few days that have made the fields virtually unusable, at least out on the warning tracks. Jogging around them is out of the question, so I’ll have to make use of the access road into camp, thus going back and forth rather than in circles–breaks up the monotony, I suppose. I had to go into Boca Chica for some supplies yesterday, so I phoned my usual motorbike driver to come pick me up and bring me back. I could see the clouds starting to move in, but thought I could get there and back before the rain started. I got there ok, but the sky opened as we were coming back to camp. Luckily, we were near a small shop that let us stand inside to wait for an opening in the clouds. As expected, about 10 of the players have left for Tampa, but the new guys haven’t come to camp yet. A couple of my classes have been somewhat depleted, but that gives me more opportunity to work with them individually, if necessary. The Yanks won their opener yesterday, topping Toronto 3-2. Sweeeeeet! We’re in 1st place! More later. I mentioned in a previous post about the fires that are set in order to burn off the dead undergrowth this time of year. Here’s a couple of photos of the smoke from a few fires that were started just outside the camp. 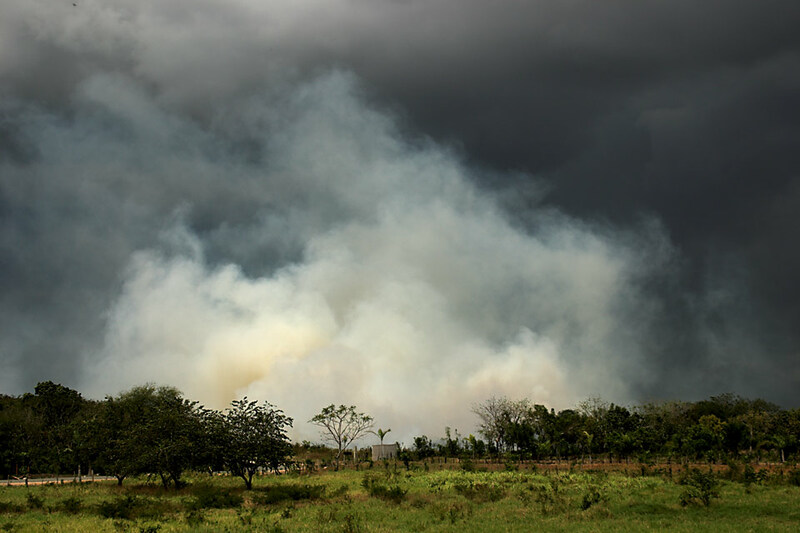 The first image was taken through my bathroom window, and, with the large cloud of smoke, it’s a good thing the wind was blowing away from us. The second photo is from my balcony. Though the smoke is not as bad, the wind is blowing toward us, so the field was beginning to get a bit hazy. You can see how dense the smoke can get, but in reality, the size and the intensity of the flames are quite small. I walked outside the fence and took a look at the area of one of the burns the day after, and most of the larger, living stalks (1-2 feet tall) of whatever kind of plant they are, were barely singed. There’s sometimes so much smoke coming off these burns that you’d think the blazes must be huge. They’re not. Where there’s smoke, there’s fire–but not much. Apparently, there was a small oil spill near Boca Chica last week, causing the closure of the beach for a short period. It wasn’t too serious, and the Weekend Office beach was open this past weekend. I read today that the shipper was fined 7 million pesos (about $210,000) for the cost of cleaning up the spill. 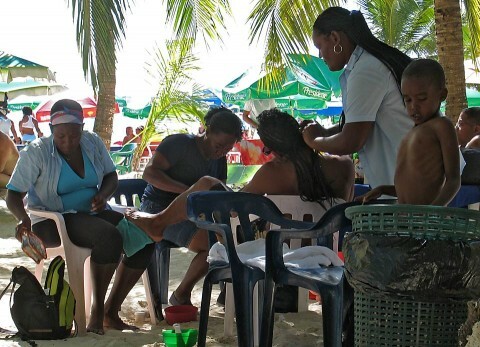 Also last week, the Dominican Republic was host to a summit of Latin American nations. Hugo Chavez of Venezuela, as well as his counterparts from Ecuador and Colombia were present, and they shook hands and made up over the recent spat about Colombia’s incursion into Ecuador. A couple of the Venezuelan players told me that Chavez and some of the other leaders were staying at Hamaca Resort in Boca Chica. I looked around for some sign of them on Saturday to try to get some photos, but I saw nothing, so I assume they had already returned to their home countries. Nai seems to be doing better, but he’s still weak. When I called him this morning (early evening in Laos), he was out walking around, albeit with the aid of Pui, his brother. I, however, am just now getting over a bug of some kind that I picked up last Monday or so. I even cancelled last Wednesday’s classes because I felt so badly, and I’m still not 100%. Thus, my running program has sure gone to heck, though I did manage to survive a 45-minute jog this morning. More later. I was sitting in the Weekend Office yesterday when a large, heavy-set, florid man, about my age, plodded over to me. He sported a shaved head, wore a couple of gold chains around his thick neck, barely clearing his jowly chin, and had a rather large beer-belly that flopped over his swimming trunks. He stood about two feet away from me and started to practically yell in my face that Toronto was the team to beat this year. I asked him why he thought so, but his response was he’d bet me $1000 right now that the Blue Jays would beat the Yanks by at least 5 games this coming season. (I was wearing my Yankee hat at the time.) I declined. Then he proceeded to rant about how A-Rod came crawling back to the team, about how the pitching would be non-existent, and about what a chicken s**t organization the Yanks are. I really, really wanted to jump on this guy, but I just smiled and nodded my head. It seemed the best thing to do, then. While I’m not technically a member of the Yanks nor an employee of the State Department, I suppose I do, in a way, represent them. So, in a situation like that, it’s best to keep my cool. The guy bloviated some more, but finally gave up, probably sensing that I wasn’t going to rise to his bait. As he walked away, I wished him good luck this season. I forgot to ask him where he was from (not that I could really get a word in edge-wise), but I’ve never met a Canadian who was such a blow-hard, red-neck type of person, so I assume he was from the U.S., but I could be wrong. I found out that my Weekend Office is owned by Cris Ozuna, brother of Pablo, who plays with the White Sox. 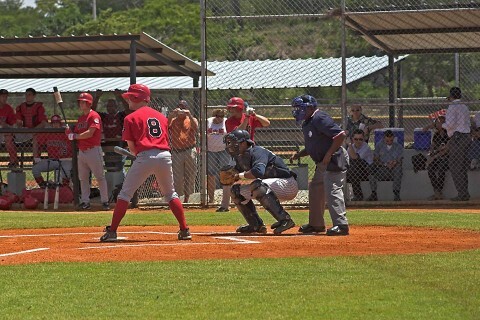 It’s interesting that in choosing my “office,” I unknowingly picked one with a strong baseball connection, though you could hardly swing a bat in the D.R. without hitting something connected to the game. One of the new guys working at The Office asked me about myself and got quite a kick out of the fact that I work with the Yanks, so he introduced me to Cris. I already knew about his brother, who was in The Office the weekend before. 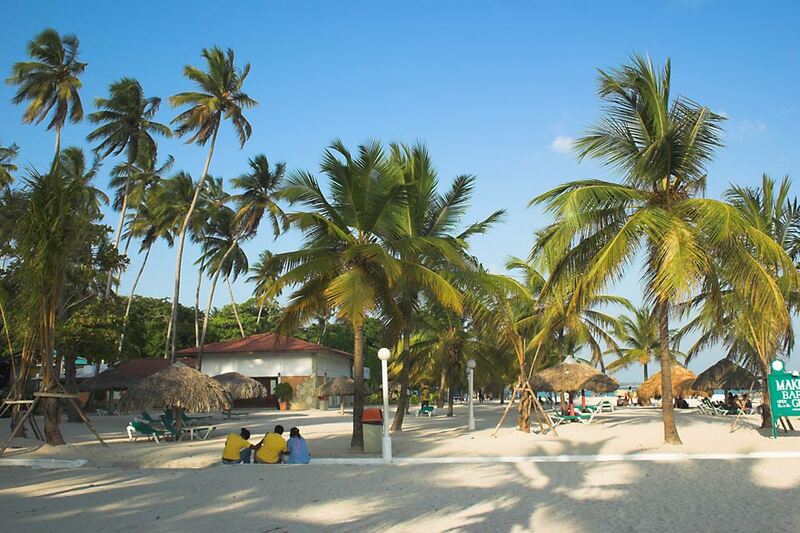 The thing about this area of the beach is that there are a lot of regulars who come here, older expats living in Boca Chica, and the overall ambience is usually friendly and laid back. Not to mention palms swaying in the gentle ocean breeze and good (but not too loud) music playing from the bar just down the beach. I also get a few questions about how it came about that I work with the Yankees, so I tell people about the English Language Fellow program and its connection with the Bureau of Educational and Cultural Affairs of the State Dept. 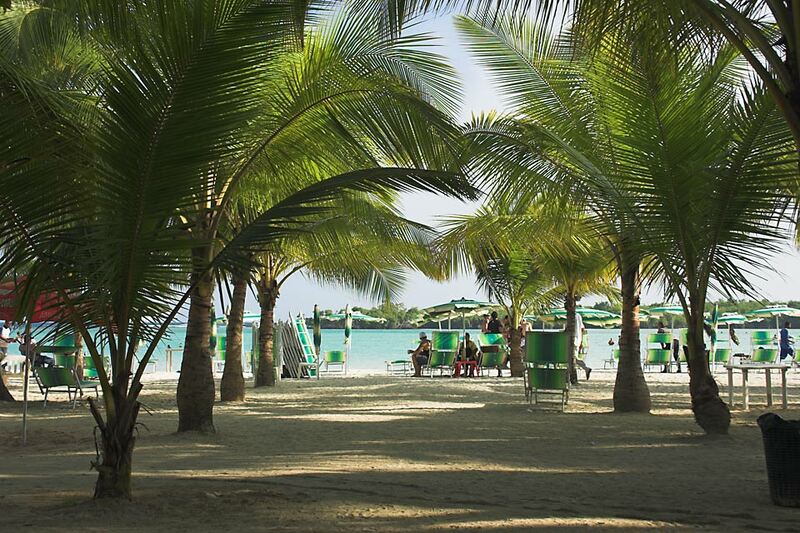 Unlike people in some countries, Dominicans, for the most part, like Americans. It seems that almost every Dominican I’ve met has at least one relative living in the U.S.
That’s a thing I’ve noticed about Laotians, too. They seem to genuinely like Americans, despite what we did to their country during the Vietnam War. (See my previous post on this subject.) It’s always nice to be liked, eh? Back to the beach. There are quite a few ladies walking the sand who will give you a massage, pedicure, or manicure, or who will work on your hair. This guy seemed to want the works, with three ladies giving him a makeover. Oh, yes, I’ve finally started adding photos of my time in Montana this past summer and fall. Click here to have a look at Big Sky Country. A lot of the photos were taken from a moving car with a point-and-shoot camera, so the quality isn’t that great, though it’s not that bad either. Enjoy. More later.